Winemaking is almost certainly not an activity that you associate with Bali – unless I have underestimated the knowledge of my readers! Until recently I would have not have done so myself, but then learned that not only is wine made in Bali but that viniculture is quite widespread in the tropics and is a well researched craft. So I recently paid a visit to Bali to see for myself what is entailed. First a little background. Grapevines were probably introduced to Indonesia by the Dutch and have certainly been cultivated there since at least the early 18th century. Early sites included Bantaeng in South Sulawesi and Kupang in East Nusa Tenggara on Timor island. In 1828, the Hoofdcommissie v.d. Landbouw (Central Agricultural Committee) recorded vines in Besuki on the north coast of East Java and at Banyuwangi on the Bali-facing west coast. In time, vines became a widespread domestic plant, mostly for table grapes or raisins, but no doubt some growers were making wine. Now, at Junrejo, Batu in East Java, the Balijestro Research Institute for Citrus and Subtropical Fruit maintains a grapevine programme. It has identified 2,000 ha. of suitable land across Indonesia and provides cuttings to growers. Today, though, the only Indonesian wine island of note is Bali, being more Hindu-leaning than Muslim and with a significant market among visitors and expats, mostly in restaurants and hotels. 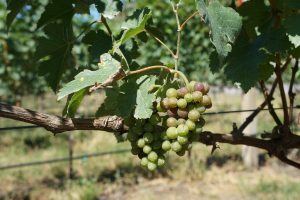 Though the acreage has been in long-term decline, grapes are still widely grown by farmers, covering around 1000 ha., both for table grapes and the wineries. The vineyards are in the agricultural north of the island, mostly on the coastal strip and in the foothills of the volcanic highlands. The coast has deep alluvial sandy-loam soils over deep sand; the bedrock is way below but is presumably volcanic. Given the success of wines made on volcanic slopes elsewhere, such as Mt Etna in Sicily, one might think that the uplands are a more obvious site than the coast, but their humidity is drenchingly high, so that leaf rot is a problem. However, the highlands shelter the coast from the hot, dry south-easterly monsoon winds, though the typical noon temperature in the shade is still around 35°C, and vineyards are not shaded. Not only do vines cope with this, but actually the problem is getting sufficient ripeness, as the hours of sunshine are short at this latitude, just 9° south of the equator. Vines in Indonesia will fruit three or even four times a year so both viticulture and the wines are always going to be distinctive. Traditional farmers use pergolas, providing some isolation from ground heat and a protective canopy of foliage against the sun, while irrigation, by hand or drip, is essential. Grapes ripen differently in different seasons, so blending across the year’s harvests is common. Grape varieties are also distinctive. The most noteworthy is a white grape known locally as Belgia (the g is hard). Its genetic makeup was investigated by Sababay winery (see Part 2) and is probably a variant of Muscat Saint-Vallier. Note that there are hundreds of grape varieties called Muscat something, many unrelated to any of the others, as is probably true of Belgia. Another local grape, of undetermined DNA, is Probolinggo Biru (‘Probolinggo green’ in Javanese), probably brought across the narrow strait by settlers from the eponymous town in East Java; but this grape is now hardly planted and is almost extinct. The only noteworthy black grape is Alphonse Lavallée, known locally simply as Anggur Bali (grape of Bali). It is a cross developed in France of Muscat of Hamburg with the Georgian grape Kharistvala Kolkhuri. In Bali it yields wine with a tropical fruit nose but modest quality; dozens of international varieties, including warm-weather varieties such as Syrah and Tempranillo, are being tested, trained on trellises, as possible replacements. Part 2 will describe the wineries in Bali and my visit there.